CALCZAF and correction of interference by subsidiary and higher order lines? I would like to perform an interference correction of Pb MB (and maybe also Pb MA) intensity for interfering lines of other elements. I know, that the topic (associated with monazite and xenotime dating) is quite extensively discussed in this forum. However, I face some additional issues. In the example shown in this referred topic, overlap of Y LG3 on Pb Ma is corrected using YPO4 interference standard. How the matrix correction factor for this Y LG3 line is calculated in PfE? I noticed some discussions on Monte-Carlo-simulated alpha factors, but I am somewhat confused and lost, and I do not understand, whether this is the way how the correction of e.g. Y LG3 on Pb Ma is done in PfE. Can this be done in CALCZAF, generally, for any interfering line? And is there some relation between ZAF of let’s say 1st order line and 2nd order line (e.g. TiKb (II), CeLa(II))? The second issue is not so important for the question but explains my motivation. We measure (and wish to correct) Pb concentrations in complex HFSE (Ti-,Zr-,Nb-), REE, U+Th -bearing minerals rather than in monazite or xenotime. In addition to the well documented Th-, Ce-, and Y- interfering lines, Pb MA is strongly overlapped by NbLb2,3,4 lines and Pb MB may be slightly overlapped by Nb Lc line and a shoulder of a strong TiKb(II) line in our material. So, I need to calculate the corrections not only for the lines involved in mnz/xtm analysis, but also for the lines of the mentioned additional elements. By the way, I can see that CALCZAF can calculate ZAF using tabulated MAC’s by several approaches, but the X-Phi routine of Merlet used by PeakSight of our CAMECA SX100 is not implemented. Is there some special reason? I have not found any mention of that in this forum. Re: CALCZAF and correction of interference by subsidiary and higher order lines? As you know the idea of the quantitative spectral interference correction is to correct for the differences in the matrix correction between the standard used for the interference correction and the sample being measured. Since the standard used for the interference correction must contain a known amount of the interfering element, *and* none of the interfered element, *nor* any other elements interfering with the element of interest, they are likely to be compositionally different. In fact, since we generally prefer an interference standard which contains a high concentration of the interfering element (for best precision), this is usually the case. Though not always! But there's a trick we use in the spectral interference correction code to make the matrix correction of these obscure interfering emission lines much easier. Because any photons from any interfering emission lines are being detected by the same spectrometer (which is already tuned to one of the major lines of interest that we are measuring), we can make an assumption (at least for the case of first order emission lines causing the interference), that the photon energy is the same as the emission line that is being interfered with. Therefore we might assume that we can apply the same matrix correction (for the line being measured), to the line causing the interference. However, this assumption breaks down if spectral interference is caused by a higher order reflection. In these cases, the photon energy of the interfering line is at least twice the energy of the line being observed, so in these cases we simply skip the matrix correction and just utilize the concentration ratios without a matrix correction, as suggested in our original paper. The justification being that a high energy emission line has a small matrix correction, and is therefore close to unity. The other assumption is that the fluorescence effects are the same for the measured line and the line causing the interference in the interference standard and the sample. For K edge fluorescences this is going to a reasonable assumption, but it starts to break down for L and M edges. So this assumption is at least approximately the case, but to be absolutely rigorous, we should perform the full matrix correction of each interfering emission line, which as you point out, would be a lot of work! As you know, CalcZAF only calculates matrix corrections for 12 different emission lines (Ka, Kb, La, Lb, Ma, Mb, Ln, Lg, Lv, Ll, Mg, Mz), so for those really obscure lines, this is going to be difficult. For the example you mentioned of Y LG3 interfering with Pb Ma, the Y LG3 line is a first order reflection, so you are good to go with the assumption that the matrix correction for Y LG3 is approximately the same as for Pb Ma. In fact, we have not observed cases where the simplifying assumptions made above caused any problems, but we would be interested in learning of such cases if you come across any. thank you very much for your reply. I should have thought of the physics more, now it seems to be so clear. It is nice to realize, that neither the photons passing through the matrix and being detected at PbMA position nor those being absorbed, take care of their origin; instead, their behaviour depends on their energy! Please, could you write me, if there is some special reason for the fact that X-Phi algorithm of Merlet is not implemented in CALCZAF? By the way: due to numerous and relatively strong spectral interferences of Nb, Ce, La, Th, Ti, Zr, Y, U... in the surroundings of PbMA and PbMB, my measured Pb is highly probably undervalued, as the continuum is buried below the noticeable characteristic spectra of the interfering elements in the whole region. I wonder about trying to correct the intensity not only at the peak position, but also at the “background positions”. The idea is to measure: (I) Peak of Pb line+continuum+Interferences at the position of the line; (II) Bgr1 with minor interferences; (III) Bgr2 with minor interferences; (IV) manually correct Bgr1 and Bgr2 for interferences; (V) calculate Bgr at peak position from (IV); (VI) correct peak of Pb for interferences and subtract Bgr yielded in (V), (VII) calculate concentration of Pb using CALCZAF. Has anyone attempted to perform such a complicated measurement this way? Sorry to be crude, but you are looking for extreme high complications and almost impossible things to do without huge errors. Forgive me this stupid analogy, but it is "as if you were trying to make an over-easy egg while starting with a bunch of scrambled eggs...". If I understand you correctly, you would like to correct a **wrong** background measurement (i.e., not a true background as there is an influence from a neigbouring peak) by an interference correction??? Even if you could do so, you would certainly add a LOT of uncertainty, along with a high inaccuracy. The problem is here multiple. First, your "interference" measurement on the background will be subject to a high precision error as this interference will be (hopefully!) high. Second, and most important, considering that you apparently do not have a way to perform a proper interference correction with the improved Donovan method, you will have to run an iterative background correction MANUALLY (even Probe for EPMA does not offer such an insane option as "background interference correction" - a background MUST be interference-free). Even if you could extract the ZAF factor using CalcZAF (which I'm not sure you can do easily in your case), you will certainly have to do that 4-5 times for ONE interference on ONE measurement, and then repeat this 4-5 times until the results converge. If you add 5 interferences on the peak and more interferences on the background, you are looking at a 100+ iteration loop (the interference correction has to be done iteratively WITHIN the iterative ZAF correction)! And we are still speaking of ONE measurement! This is insane! To cut short: if you want to have an accurate trace element analysis, you MUST first find a background free interference, which I know is difficult in REE-rich materials and when analyzing low (trace) amount. This is why Mike Williams, Mike Jercinovic, John Donovan and myself developed the multipoint background correction. A paper is coming out in the February issue of Microscopy and Microanalysis (to come out soon...). If you send me a private email at julien.allaz [-at-] erdw.ethz.ch, I can send you a copy of the pre-print version). It is of utmost importance to have adequate background (again WITHOUT any interference, even a small one!) as even a small error on the background will easily yield an inaccuracy of 50-100 ppm on your measurement. I would highly recommend you to read carefully Jercinovic et al (2012) DOI:10.1088/1757-899X/32/1/012012 and reference therein for details on accurate Pb measurement in REE phosphate. I think you should really consider finding a better software, or if you use Cameca's Peak Sight, then re-consider your background position and find at least two suitable backgrounds, then apply an exponential background correction (because the background is NOT linear, and it is likely you will have to select positions far away from the peak). It won't be a "best" solution, but definitely better than trying to correct a background for an interference... What are you currently using (instrument model, software?)? I cannot answer your question about the X-Phi algorithm of Merlet, John will be better at answering, but if you want to emulate what Cameca is doing, you can simply choose the PAP or XPP model - to my knowledge, it is rigorously what the original Cameca software employs. It's a good question. But there are already 10 matrix corrections in CalcZAF/Probe for EPMA, of which several give excellent results. Frankly I think that we have bigger problems in EPMA with beam sensitive samples, peak shape issues, background measurements and interference corrections, particularly the last two as you correctly point out. I read about Merlet's X-Phi algorithm at the time he presented it, but he did not want to share his source code and in any case I no longer know how to reach him now that he retired. But to be honest I'm not sure it is any improvement over the Armstrong/Bastin, PAP and XPP models so it would be a very low priority for me. Both Philippe Pinard and Xavier Llovet think this is the way forward, but both are pretty busy, though I would be pleased to implement anything they come up with. Personally, I think that Merlet’s model should be fully documented and preserved in CalcZAF since it is not fully presented in the literature (the atomic number correction is missing). X-Phi was one of the last major models to emerge (during the period 1992-1995), and so Merlet had the benefit of being able to address shortcomings of previous models. 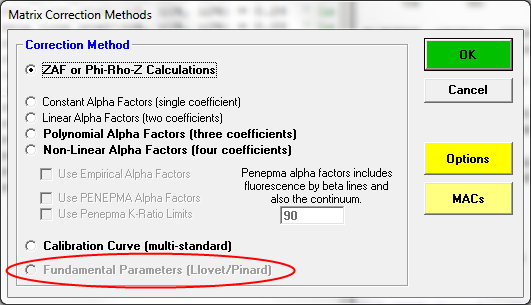 As with PAP, his model was designed to produce accurate phi(rho*z) curves. I’d be happy to do the programming. How would you deal with the missing atomic number correction? I guess I'd need to plead with Merlet or one of his colleagues to make it available. Dear John Donovan, thank you very much for your answer. I did not want to assign you a homework to build a code with X-Phi correction. I was only interested in the reason, because this algorithm is used in the default Cameca software, at least in the version we have. So, to know, if there are any reasons against the algorithm of Merlet. So, it is not possible to run the same correction algorithm in both, CALCZAF and PeakSight; but it is no problem. Now, I understand the reason.